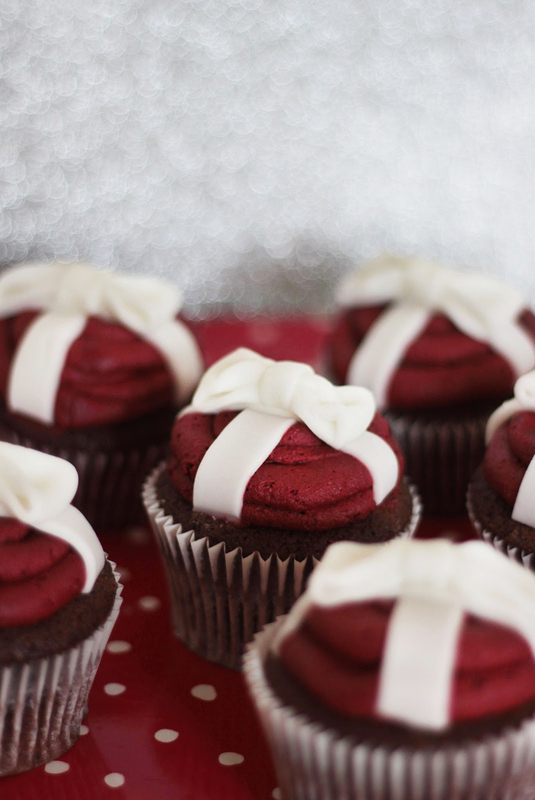 I'm rather excited about this weeks blog post as it contains Christmas cupcakes! I feel like in the last week the blogging world has gone a little gift guide crazy so hopefully this post breaks them up! 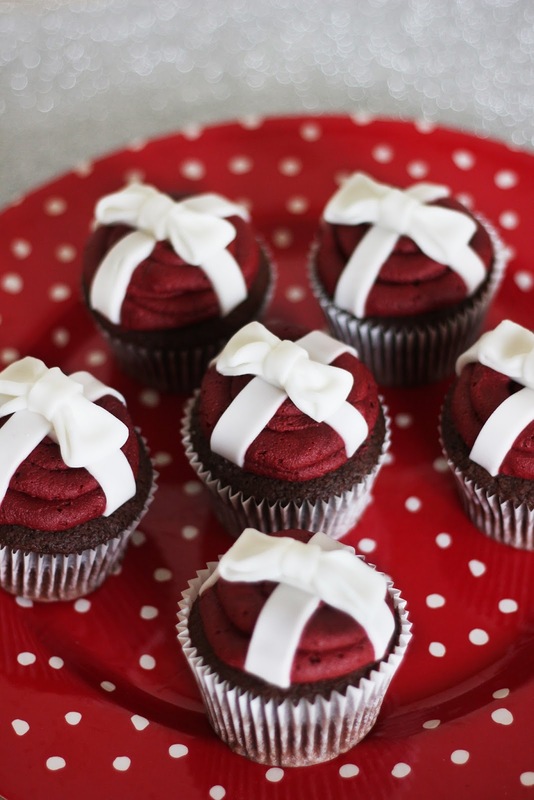 Now these aren't just any cupcakes, these are chocolate flavour with bows on the top, so they look just like a little Christmas present. I think these would be the perfect thing to bring to a Christmas dinner as a special treat for afters, and I'm sure all of your friends and family would be pretty impressed if you brought these out. Now, I have a little confession, I didn't make these as I cannot make a cupcake as pretty as this, I collaborated with my friend and self taught baker Bryony who has the most wonderful baking Instagram (which you can check out here!) I wanted to have truly amazing Christmas recipe to share with you and I'm just so happy with how they turned out! It's only 25 sleeps until the big day so you have plenty of time to practice! Preheat oven to 170 degrees Celsius/ gas mark 3. Put flour, cocoa, sugar baking powder, salt, butter in a mixing bowl. Mix together with an electric mixer until sand-like in texture. In a jug, whisk the egg, vanilla and milk until combined. Pour half of the liquid mixture into the dry mix. Whisk on a high speed until combined. Put your mixer onto a slower speed and pour in the remaining liquid. Mix on a low speed until completely combined. Spoon the mixture into the twelve cases about 3/4 full. Now pop in the oven on the middle shelf for 20-25 minutes. Remove the cupcakes from the oven. You can check they are perfect by using a cocktail stick - it should come out clean. While the cupcakes are cooling, make the butter cream. To do this, first beat the butter with your mixer in a bowl for around 5 minutes. You want a light and super smooth texture! Then add the icing sugar and cocoa powder, roughly one third at a time, mixing well each time and ensuring the sides of the bowl are scraped as you go. Add a drop of the milk on each mix to get a light and fluffy consistency. Now add a generous teaspoon of red food colouring - you're looking for a deep red so keep on adding food colouring until you achieve the colour you're after. When you're happy with your icing, spoon it into your piping bag that has your round nozzle in (top tip: use a pint glass to hold your piping bag while you fill it, folding the sides over the rim of the glass). Snip off the end of the piping bag. Pipe directly onto the cupcakes, starting on the outer edge of the cupcake working your way in, using a smooth, continuous circular motion. 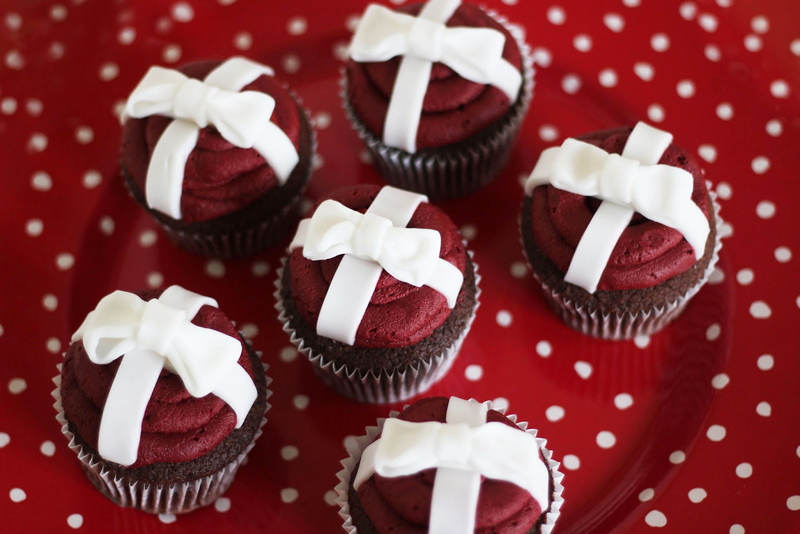 Once all the cupcakes are iced, it's time to make your fondant bows. Roll your fondant out on a surface lightly dusted with icing sugar, until around half a centimetre thick. Trim the edges of the fondant to make a rectangle, Then cut into 1cm width strips. Use these strips to create the cross on top of the cupcakes, trimming the edges once in position on top of the cupcake. Now repeat steps above to make another identical fondant rectangle. This time cut the fondant to 2cm by 8cm strips. Lay the fondant with the longer edge facing you. Take the left hand of the strip and fold into the middle. Repeat with the right hand side so the two edges meet in the centre. Now pinch the centre and use a small strip of fondant, to lay over the join and pinch behind the bow to seal. If the fondant isn't sealing together, use some water on your fingertip to seal. 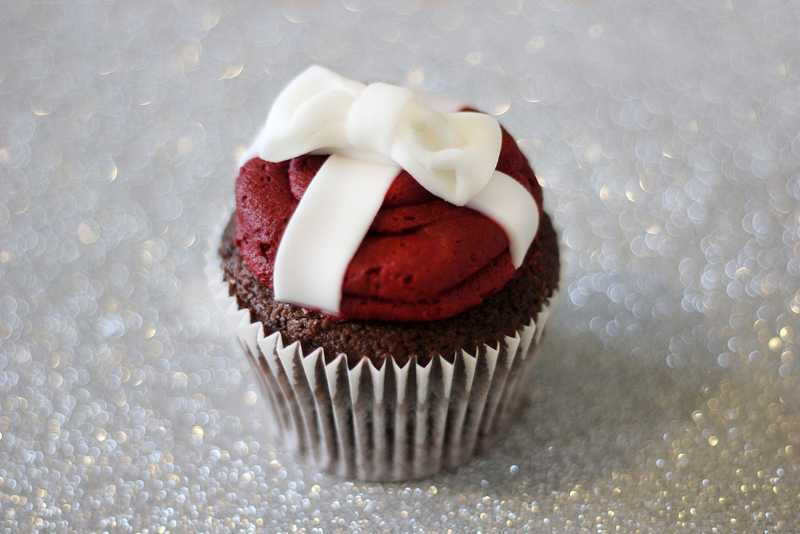 Place the bow in the centre of the cupcake. aah these look absolutely amazing!